The singly greatest actor that has ever lived and a role model to my own acting, Meryl Streep is incomparable. 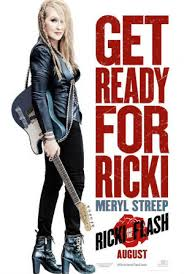 When I walked out of the theatre after Ricki and the Flash, I started thinking about all the other films I’ve seen her in. It’s just astounding that a person who has been in so many films has been able to create, and continue to create, characters that are so entirely different from each other, even when there are similarities between them. She captures my attention and wholly suspends my disbelief. With other actors’ performances, there is always at least one scene in each of them where I think, “Oh yeah, I’m watching so-and-so.” Not with Meryl Streep. She plays them so expertly that I am only ever watching her characters: Joanna Kramer, Sophie Zawistowski, Karen Blixen, Madeline Ashton, Karen Silkwood, Susan Orlean, Julia Child, Margaret Thatcher, Sister Aloysius Beauvier, Clarissa Vaughn, Miranda Priestly, and now Ricki Randazzo, and everyone else in between. She is the epitome of perfection.